If you fly Alaska Airlines and/or Virgin America, the Alaska Airlines Visa Signature Card from Bank of America might be a winner for you. So you actually get two sign-up bonuses for the price of one here, which is pretty rare, and with a relatively low minimum spending requirement of just $1,000. First things first, you can earn 30,000 Alaska Airlines miles after you spend $1k in the first 90 days. That’s enough for three one-way tickets from the West Coast to the East Coast, or vice versa, in coach. It’s also enough for a round-trip ticket on such a route. Or if you’re just traveling up the West Coast, say from Los Angeles to Portland, you can muster two free round-trip tickets in coach out of the sign-up bonus. And if you have a companion, say a spouse, friend, or child, you can bring them along for just the taxes and fees thanks to Alaska’s Famous Companion Fare, assuming you spend the $1,000 to unlock the promo code. If you do, the Companion Fare will only set you back for the taxes and fees because they waive the typical $99 base fare associated with the perk. However, you still must pay the applicable taxes and fees. There are no blackout dates to take advantage of this benefit. For the record, taxes and fees start as low as $22, and it only works for a fully paid coach airfare ticket. So you can’t book your ticket with miles and add someone for a pittance. The good news is you and your companion can both earn Alaska miles for these flights though. It’s also possible to book an upgradeable ticket with this companion fare and then hope you get bumped to first class later down the line. To make the most of it, you may want to book a longer-haul flight, such as a trip to Hawaii, or a flight across the nation. Obviously, the more your ticket costs, the greater the benefit of tacking on an additional ticket for just the fees. After year one, and for each card anniversary thereafter, you’ll get another Companion Fare, but it won’t waive the $99 base fare. So you’ll have to pay $99 plus at least $22 for taxes and fees. Still, that’s pretty cheap if your primary ticket costs $500 or so. The base fare will vary depending on the itinerary. Tip: The companion fare promo codes are good for one calendar year, but as long as they’re booked, the actual flight date can extend beyond the expiration date, meaning you can book well in advance. Aside from those great benefits, you also get a free checked bag when flying Alaska or Virgin America. This benefit actually extends to you and up to six other passengers on the same reservation, so you shouldn’t have to worry about baggage fees in most situations. There are also no foreign transaction fees charged on this card, and the annual fee is a very reasonable $75. Lastly, you can earn 3 miles for every $1 spent directly on Alaska Airlines and Virgin America, and a mile per dollar spent elsewhere. All in all, the Alaska Airlines credit card offers tremendous value for someone who plans to fly either Alaska or Virgin America. As noted, you can get several flights for free if you fly up and down the West Coast, or a free round-trip ticket across the country. And the companion fare is the icing on the cake, especially the one during the first year that waives the $99 base fare. The only thing that would perhaps make the Alaska Airlines credit card even sweeter would be free access to Alaska Airline lounges, but I guess you can’t have it all. Update: Alaska Airlines is no longer doing this, thank goodness. Both versions of the card will now receive the same benefits, though the annual fee will be bumped up to $75 as a result. There’s one major problem with applying for the Alaska Airlines Visa. It’s possible you’ll only get approved for the inferior Platinum Plus version of the card, as opposed to the Visa Signature version. This may happen if you have insufficient credit, aka a low credit score, or if you’re unable to get a credit limit large enough ($5,000+) to get a Visa Signature card. If that’s the case, you won’t get the benefits or the bonus miles described above. 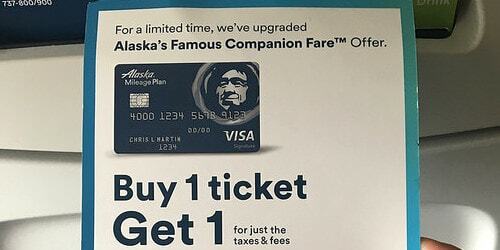 You’ll basically just get a credit card that earns 2 miles for every $1 spent on Alaska Airlines and Virgin America. Well, you also get a $50 airfare discount on your anniversary date, which actually offsets the lower $50 annual fee tied to this version of the card. And an inferior sign-up bonus of just 5,000 bonus miles when you spend $1,000 or more in the first 90 days. Oh, and no foreign transaction fees, at least. In other words, you may want to hold off on applying if you think you’re not Visa Signature material. You can check out my FICO score range to see where you stand first, then determine if it makes sense to apply. Income may also come into play, along with existing credit lines at Bank of America. If you’ve already got a lot of credit with them and don’t think you’ll be able to muster another $5k, you may want to call after applying and see if you need to shuffle your credit lines. In fact, you may want to call in regardless to ensure that you get approved for the better version of the card to get all the best benefits. More: There is also a business version of the Alaska Airlines credit card that comes with the same benefits as the personal Visa Signature version. The only difference is that the Companion Fare doesn’t waive the $99 base fare the first year.